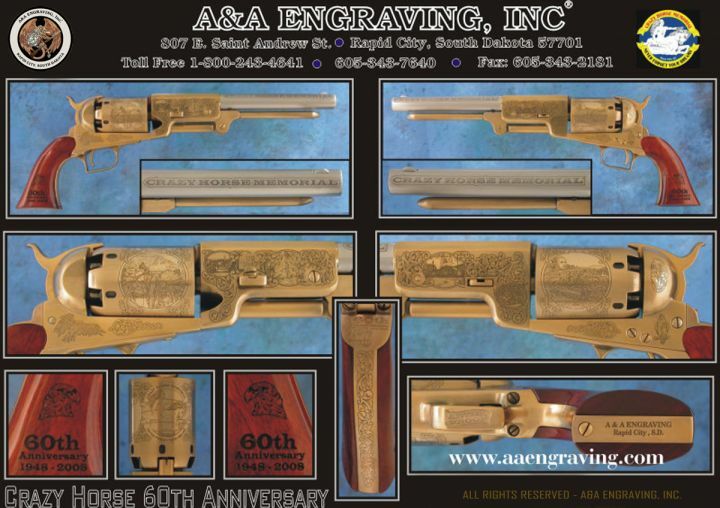 Native American | Custom Western Firearms | Inventory | A&A Engraving, Inc.
Commemorative Firearms highlighting Native American themes and culture. This commemorative benefits the ongoing development of the Crazy Horse Memorial in South Dakota, which is still maintained by the family of late sculptor Korczak Ziolkowski. Finish: Classic Antique Gold finish w/ laser engraved walnut wood grips. Individually numbered. Includes: Optional wood display or French-fit carrying case w/ embroidered logo. Certificate of Authenticity signed by Mrs. Korczak Ziolkowski and select Crazy Horse Memorial Committee Members.